Getting around in the snow can seem like a challenge – but it can also be a lot of fun, depending on how you choose to do it! Snow fall doesn’t have to be a barrier to seeing the landscape and to exploring your surroundings. The best thing to do if you want to see the area in a car is to hire a sturdy vehicle in advance from a decent local hire outlet, and make sure that the car is stocked up with everything you’ll need to get to where you want to go. You also need to make allowances for getting lost, stuck or cold. Hire some snow chains when you take cars – they will usually charge you for this but they are well worth the expense and some countries will insist on them anyway. Snow tyres on cars that are going out in bad conditions are obviously essential but the hire firm will be able to advise you about those. If you’re going out in the car in treacherous weather, take a charged mobile phone with you, as well as a torch, a first aid kit, and warm blankets. Take some high calorie snack food with you in case you get stranded, and a warm flask of drink. You never know when you might get stuck, snowed in or lost! The car also needs to have an emergency kit containing de-icer, a scraper, jump leads and a shovel. Snowmobiling (or skidooing) is a fun and exciting way to travel and see some of the wilder areas that you may not be able to reach by car. 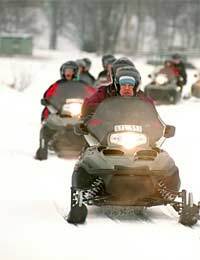 A snowmobile is a petrol engine powered vehicle, similar to a quad bike for the snow and ice. Specially designed for winter conditions, it can travel at up to 70 mph so it’s not for the faint hearted! You’ll need a full UK driving licence or motorcycle licence to be able to hire and ride a snowmobile, and if you’re tempted, make sure you’re properly dressed for the trip by wrapping up in layers, covered with a snowsuit, and finished with gloves and a balaclava suitable for keeping the cold away from your face. You will certainly feel it at that speed! Remember to make sure that you have appropriate insurance if you are hiring a snowmobile, as most standard winter sports policies don’t cover snowmobiling. Husky sledding is a brilliant way to see the sights in the mountains, and can be great fun. There are countless expeditions organised by resorts, and it’s certainly an experience not to be missed if you’re an animal lover. Some husky expeditions are supervised to the point where you will have an experienced rider manage the huskies, but in others you can have the full experience of being able to direct the huskies yourself, with a few simple commands. You’ll need to wrap up very warm for husky sledding, especially if you are the person sitting in the sled, because you aren’t being active as you would be with some other winter sports. Layering is crucial, as are warm, sturdy shoes, gloves, hats and anything to cover your face. You’ll be surprised at just how fast the dogs can run!